Join the CALS Ron Robinson Theater for Silver Anniversaries on the Silver Screen, as they celebrate films that turn 25 in 2019! Tonight’s feature is The Shawshank Redemption. A prominent banker (Tim Robbins) unjustly convicted of murder spends many years in the Shawshank prison. He is befriended by a convict who knows the ropes (Morgan Freeman) and helps him to cope with the frightening realities of prison life. Others in the cast include Bob Gunton, William Sadler, Clancy Brown, Gil Bellows, and James Whitmore. The film was directed by Frank Darabont, who also adapted the screenplay from a Stephen King short story. The movie was nominated for seven Oscars, including Best Picture. The showing starts at 7:00. Admission is $5.00. Probably the largest gathering of Oscar winners and Oscar nominees in Little Rock’s history took place in November 2004. Though some Oscar winners and nominees had been present for the Clinton election night parties in 1992 and 1996, the opening of the Clinton Presidential Center brought luminaries from Hollywood en masse. Among those present were Oscar winning actors Barbara Streisand, Robin Williams, and (of course) Arkansan Mary Steenburgen. Future Oscar winner Morgan Freeman was also in attendance. Among the Oscar nominees who were present were Bono and The Edge (who performed at the ceremony) and Alfre Woodard. Senator John Glenn, who had been featured as a character in the Oscar winning film The Right Stuff was also present for the festivities. Former Vice President Al Gore did not actually win an Oscar for An Inconvenient Truth (the documentary awards go to the director), but was closely identified with this Oscar winning documentary. There were plenty of rumors about other Oscar winners and nominees in town, though they were not true. The Oscars are later this month, but tonight is a chance to see the winner of the 1989 Best Picture Oscar – DRIVING MISS DAISY. It will screen tonight at 7pm at the CALS Ron Robinson Theater. Tickets are $5. Concessions are available for purchase. Based on the 1988 Pulitzer Prize winning play, Driving Miss Daisy tells the story of a textile factory owner who insists on hiring an ever-patient chauffeur for his aging head-strong mother. The Jewish woman and her African American driver eventually build a relationship over many years. In addition to winning the Oscar for Best Picture, star Jessica Tandy won the Oscar for Best Actress. Morgan Freeman and Dan Aykroyd each earned Oscar nominations for their performances. Others in the cast include Patti LuPone and Esther Rolle. Directed by Bruce Beresford (who surprisingly did not pick up a nomination for Best Director), the film was adapted by Alfred Uhry from his original stage play. Uhry won an Oscar for his writing. The film also earned a fourth Oscar for Best Makeup. In addition to the nominations for Freeman and Aykroyd’s performances, it picked up nominations for Art Direction, Costumes, and Editing. 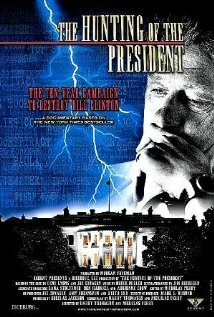 Tonight at 7pm, the documentary THE HUNTING OF THE PRESIDENT will be shown at the Ron Robinson Theater. The screening is free. Well-known director, producer and Arkansan Harry Thomason, and Nickolas Perry’s incendiary documentary, based on the best-selling book by Gene Lyons and Joe Conason, offers a glimpse at the genesis of these partisan vendettas and explores the myths and truths behind the nearly ten year campaign to systematically destroy the political legacy of the Clintons. Using previously unreleased materials, interviews, and revelations from both sides of the beltway, this probing work focuses on the smear campaign against Clinton from his gubernatorial days in Arkansas leading up to and including his impeachment trial. The film is narrated by Morgan Freeman. Others making appearances include Jonathan Alter, Steve Barnes, Paul Begala, Richard Ben-Veniste, Robert S. Bennett, Sidney Blumenthal, Max Brantley, David Brock, Joe Cammerata, John Camp, James Carville, Larry Case, Paula Casey, Joe Conason, Andrew Cooper, Gil Davis, Ernie Dumas, Jerry Falwell, Mike Gauldin, Howard Kurtz, Gene Lyons, Susan McDougal, Don Moldea, Robert Parry, Claudia Riley, Jeffrey Toobin, Bill Watt and Betsy Wright. Movies in the Park continues tonight. As the night gets dark, this week’s feature will be 2012’s The Dark Knight Rises. This follow up to the 2008 film was again directed by Christopher Nolan from a screenplay he wrote with his brother Jonathan. Christian Bale resumes the tip-eared mantle and is ably assisted by Michael Caine as butler/father confessor Alfred. Movies in the Park is a free outdoor movie series in Little Rock’s River Market. They take place at the First Security Amphitheatre. The mission of Movies in the Park is help foster a sense of community and enjoyment in downtown Little Rock and throughout Central Arkansas by bringing people together to enjoy a movie in a unique setting along the scenic banks of the Arkansas River. Movies start at dark. Visitors are welcome to bring picnics but please no glass containers and pick up afterwards. Those choosing not to bring their own picnic, the park does have concessions available for sale. Bring bug spray, picnic and family and have a good time! The Little Rock Convention and Visitors Bureau Technical Services department provides all the equipment for the movies.